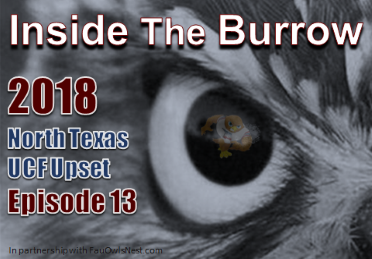 Dan, Shane, and Jack return to Inside the Burrow to discuss FAU's Homecoming win over lowly Western Kentucky. Chris Robison, De'Andre Johnson, and Devin "Motor" Singletary were namedropped as the guys discussed their play. But what roles will those players have in this week's game against North Texas? Concluding this week's episode, Jack gets crazy excited about FAU Basketball's buzzer-beating upset over UCF. Go Owls!